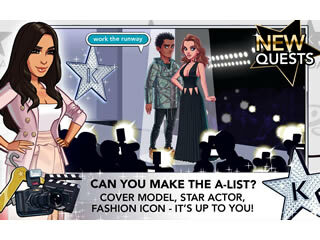 Jump into a fantasy world where Kim Kardashian is your best friend and helps you rise from a shirt folder to the top elite of Hollywood in Kim Kardashian: Hollywood. Yes, the basic idea of the game is rather silly, but it is actually quite fun. The conversations between characters are funny and the storyline is really intriguing all things considered. Use networking to work your way up the ladder in this crazy celebrity game. The game’s style can be labeled “controlled-cheesy.” It’s absurd to think that Kim Kardashian would come crashing into your workplace with a fashion emergency, then reward you with a deep friendship and a shot at a hot career, but that’s exactly what happens. You get to choose your clothes and accessories to customize your own fashion. The game is free, but you can put some real money into it and buy the best clothes for your character. One thing to beware of in this game is the dating aspect. You have to start up a relationship and are allowed to choose whether you want to be homosexual or heterosexual. There is no real difference between the two in the game. Apparently, this game is using celebrity endorsement to push a certain value system. This game will have you turn your brain off, so be aware of what messages these games are sending as you play.